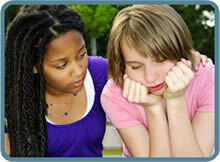 Home » Your Questions: Teens » I’m afraid to tell my parents I’m pregnant. I don’t want to leave home. What should I do? I’m afraid to tell my parents I’m pregnant. I don’t want to leave home. What should I do? Many parents threaten removal from home as a way of trying to control your decision-making. They use this threat to pressure you into making an abortion decision. After they see that threats are not working and they have time to work through their anger and disappointment, parents frequently have a change of heart. Once they see the child you are carrying as their grandchild, they frequently become a great source of love and support. Think of how your parents have expressed their love for you in the past. Have they spoken of always standing by you and loving you unconditionally? Remind them that you need them now, more than ever before. They may eventually value their role in your life and the life of their grandchild. Parents frequently see pregnancy as interrupting plans they have for their children. They raised you to be a strong-minded individual capable of making your own decisions. In time, they will see you as honorable, courageous, and worthy of respect. They will be grateful for your independence and determination once they receive the love their grandchild. They will be thankful for the joy a grandchild brings to their lives. The qualities your parents taught you will surface, as you become a responsible, independent, caring parent.